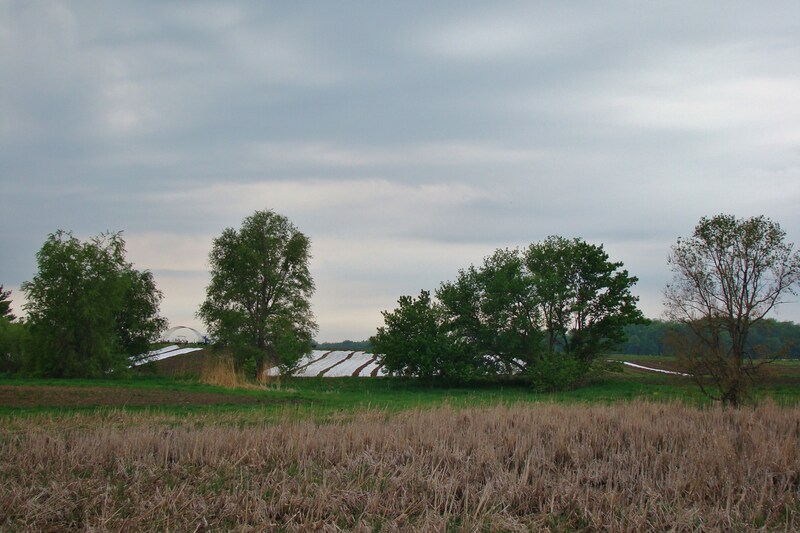 I am always amazed at how much the farm changes in a relatively short period of time, especially in spring. The transition from brown to green happens so quickly. Ironically, for a short while, we won’t even see some of this new green in the field. Why? We keep it hidden! Certain pests will devastate a crop of newly planted tender greens riddling them with so many holes they resemble tiny green Swiss cheese. Instead of spraying toxic chemicals to kill the troublesome insects, we protect the plants with plant blankets called row cover which acts as a pest barrier. 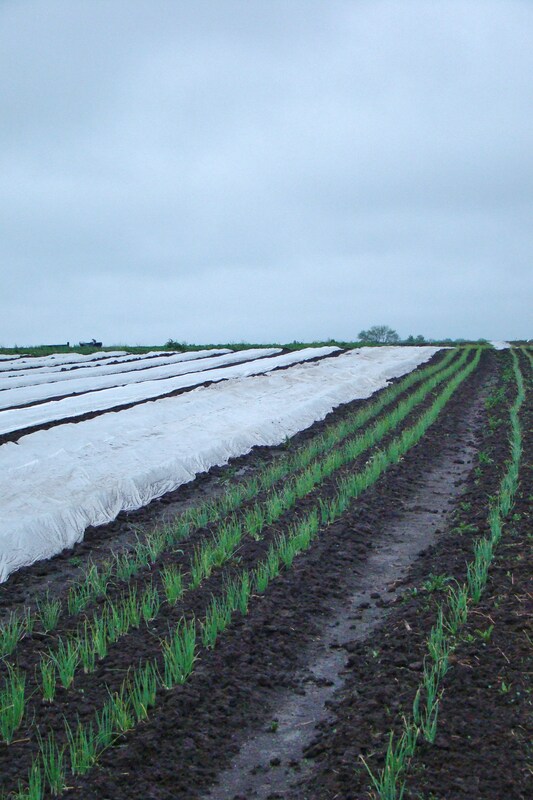 The row cover is placed over the plants immediately after transplanting. Some crops are more susceptible than others and need to have a continuous dirt border to hold down the row cover and keep out the bugs. Less susceptible crops simply need the row cover to be held down with metal pins—the continuous soil around all edges not being necessary. Much of what has been planted over this past month is at risk of being devoured. This means a lot that we have transplanted has been covered. Most early season crops like cabbages, bok choi, and other Asian greens are especially vulnerable. Onions, peas, and beets, not so—so they’re not covered. 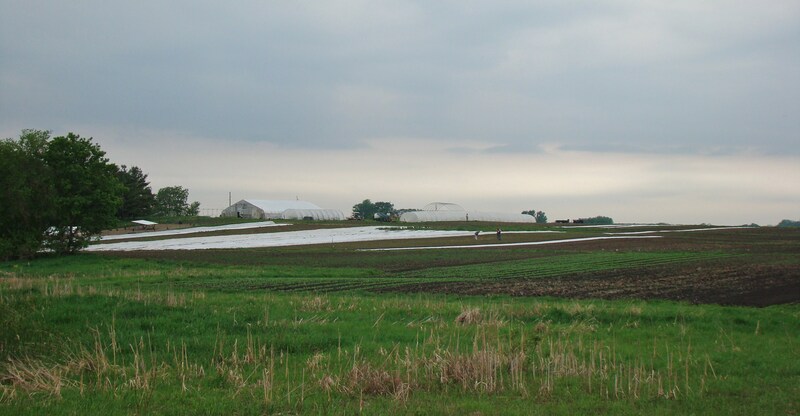 This “field of fabric” appears as an oddity in cow, corn, and soybean country. Many drivers slow down when they pass the farm, most likely wondering what in the world those long white strips in the field are for. Once the spring and early summer pest pressure of these crops has lessened, we remove the row cover. As long as the row cover remains in good condition, with few holes or tears, we save it and reuse it year after year. Agricultural waste is a huge burden on our environment and waste systems, so we save, reuse, recycle, and reduce whenever we can. Usually it is only in spring that we need to use row cover. So, a trip to the farm in mid-spring appears very different than a trip in summer or autumn. If you visit in August, it is likely that you will see no row cover in the fields. Instead, you’ll see a neat jungle of plants awaiting harvest. Plants which survived the spring pest feast because of simple “long white strips”. ← Do you know what’s in your Bread?